Do spend hours daydreaming about what it would be like to be a pirate? If it’s anything like the Pirates of the Caribbean films, then you’d spend your time cruising the high seas on the Black Pearl looking for adventure. You’d get to hobnob with colorful characters like the cunning Captain Barbossa and the devoted Joshamee Gibbs. You’d get to search for one of kind of treasures like the Heart of Davy Jones or the Trident of Poseidon. Of course, you’d also get to indulge in copious amounts of rum just like the dubious Captain Jack Sparrow! After all, if you’re going to be a pirate, you might as well be the legendary captain from the Disney movies, right? 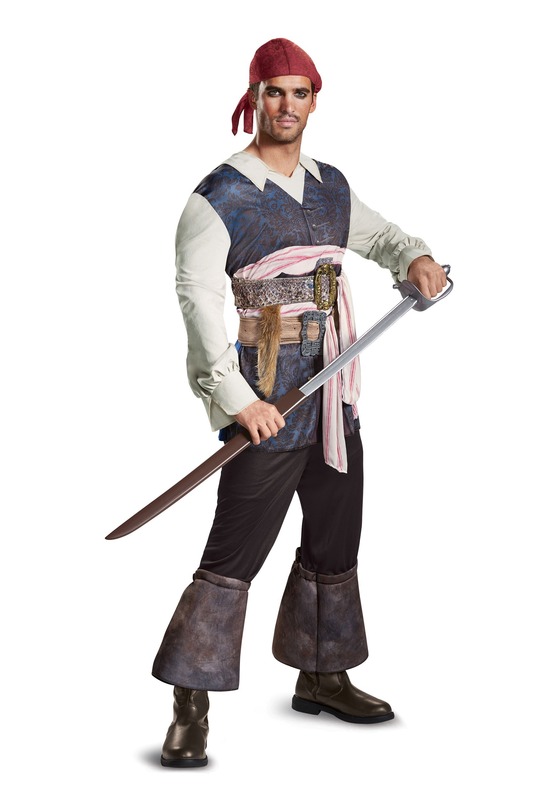 Well, now it’s easier than ever to jumpstart your life as a pirate, since this classic Captain Jack Sparrow costume turns you into the character in an instant. It comes licensed from Dead Men Tell No Tales, so the top looks like the good captain’s shirt and vest combination from the film. It gives you that wayward swashbuckler look that Jack is so well known for. The outfit also comes with various belts and sashes, since no pirate worth his salt steps foot on a ship without a bunch of belts around their waist! You also get a set of pirate pants with this outfit, since most pirates generally wear pants when they’re out at sea (sorry to all you pirates who want to wear robes). Why, the only thing missing from this outfit is a giant barrel full of rum, which you’ll have to wrangle yourself if you want the full Jack Sparrow experience. Tough to find a costume that fits since I am 6’4” but this one was very comfortable. This would have been a 5 had there been a holder for the sword like there is in the picture.